Is it possible that some badges are awarded even for the posts that have already been deleted for some time? For example, deleted questions can still be viewed by 10k+ users and mods. So the number of views can increase during the time when the question is deleted. 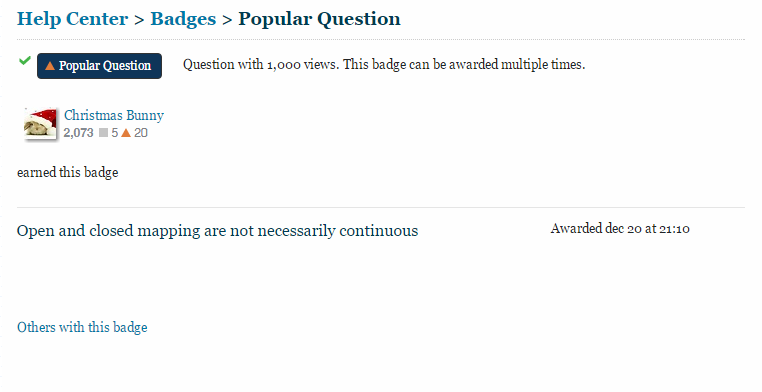 If a deleted question reaches 1000 views, is popular question badge awarded? Similarly, users who can see deleted questions can also favorite them, which could lead to favorite questions badge. I have tried to search for related questions. I found this one: I've just earnt the Announcer badge for a deleted question, which feels wrong It says that it was possible to get announcer badge for a deleted question, but it was considered a bug and it is now corrected. Basically, if we find some questions which fulfilled the criteria while deleted, we can find out experimentally whether the badges are awarded or not. The question now has over 1k views. Not the answer you're looking for? Browse other questions tagged support badges deleted-questions .